There are those who consider it to quite possibly be the best and truest movie ever made about rock music. But it took This Is Spinal Tap some time to really catch on. One Best Classic Bands contributor saw it on its 1984 opening Friday night in Manhattan. Only five other people were in the theater; one was his date. Its national opening weekend theatrical gross was a measly $55,000. The film wasn’t the first “mockumentary” ever made. But it did put the fake documentary on the film genre map with a parody that is so redolent of rock ‘n’ roll reality that some people thought it was about a real band after seeing it. Reportedly among them is Ozzy Osbourne. Among the classic rockers who sing its praises for feeling so true-to-life are Jimmy Page, Robert Plant, Eddie Van Halen, Eddie Vedder, Dee Snider, Lars Ulrich and many more. On the other hand, it’s also so close to reality that it reportedly made The Edge and Tom Waits cry. Roger Ebert wrote that Spinal Tap was “one of the funniest, most intelligent, most original films of the year. The satire has a deft, wicked touch. 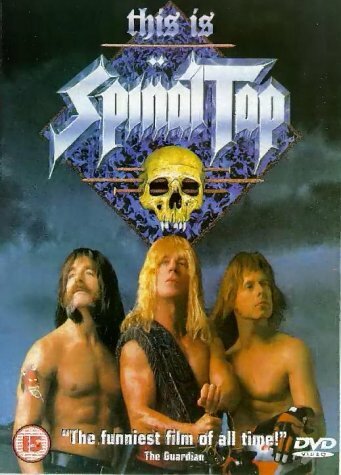 Spinal Tap is not that much worse than, not that much different from, some successful rock bands.” Despite critical acclaim, the movie didn’t reach its critical mass with audiences until it was released on video. Harry Shearer (Derek Smalls) filed a lawsuit in October 2016 alleging fraudulent accounting of the film studio and seeking $125 million in compensatory and punitive damages. In February, 2017, Christopher Guest (Nigel Tufnel), Michael McKean (David St. Hubbins) and Rob Reiner (director Marty Di Bergi) joined the suit while upping the ante to $400 million. The website Box Office Mojo notes the film earned less than $5 million in U.S. theaters. On February 1 2018, The Hollywood Reporter wrote that the creators urged the judge to allow the case to continue. Fast forward to August 29, 2018. The plaintiffs celebrated a significant benchmark in the suit when U.S. District Court Judge Dolly M. Gee turned the amps up to “11,” when she ruled to allow the trial to move forward, thus defeating the defendants’ motion to dismiss. The plantiffs have created a website, Fairness Rocks. Back to the movie itself… in an act of life imitating art that some thought was imitating life – and in a movie that imitated life brilliantly – many people think that the Stonehenge stage set joke was based on a problem Black Sabbath had with their Stonehenge set in 1983. But it was already in the 1982 20-minute demo director Rob Reiner made to help get the film rolling. This Is Spinal Tap has been included on Entertainment Weekly‘s list of The 100 Greatest Movies of All Time as “just too beloved to ignore.” Time Out London named it the best comedy film of all time. It is preserved in U.S. National Film Registry after being declared “culturally, historically, or aesthetically significant” by the Library of Congress in 2002. Best Classic Bands contributor is lying. There were at least 6 people there opening night at the one theater in Manhattan that showed the film, because I was one of them! I’ve always wondered if the bit where one of them gets stuck in the prop when they appear on stage is related to something that happened to the group Angel (big thumbs up if you remember them, actually the singer and guitarist, the illustrious Punky Meadows, have recently begun doing live shows). Angel had this huge holographic Angel head like their logo which introduced each member of the band, and then that person would pop out of a bunch of boxes or whatever, that had been stacked up by roadies during that part of the intro. It was really cool, but considering the budget, smaller venues, and technology of the day, somebody MUST have gotten stuck in the boxes more than once. Just wondering. I had a brief chat with Harry Shearer at The Troubadour decades ago when I asked him what he thought of the reunion Rutles show we were there to see. “It’s been done before,” he said somewhat ruefully. Story told to me by Robbin Crosby of Ratt:. He and Nikki Sixx took Scorpions’ lead singer Klaus Meine to see the movie. Mid-movie he got up and walked out. He was furious someone had made light of his band.